Dear lady, would you be so kind as to return my cap? ...it's a bit drafty. So Lil'Shock's been quite kind taking care of me the last 8 days or so as I've had a broken tooth w/abscess that was just removed. Meds have left me lethargic so he's picked up most of the slack around here and made an awesome chicken soup Managed to fight through my nebulous artblock for two hours to actually produce a thank you picture. Done in Manga Studio, getting better with the linework. Found that taping a piece of sketch paper over my tablet helped some. Horsemann was easy, but I've tried drawing SCP-049-l and she always gives me fits, something about that mask. Anywho, thanks Lil'Shock! 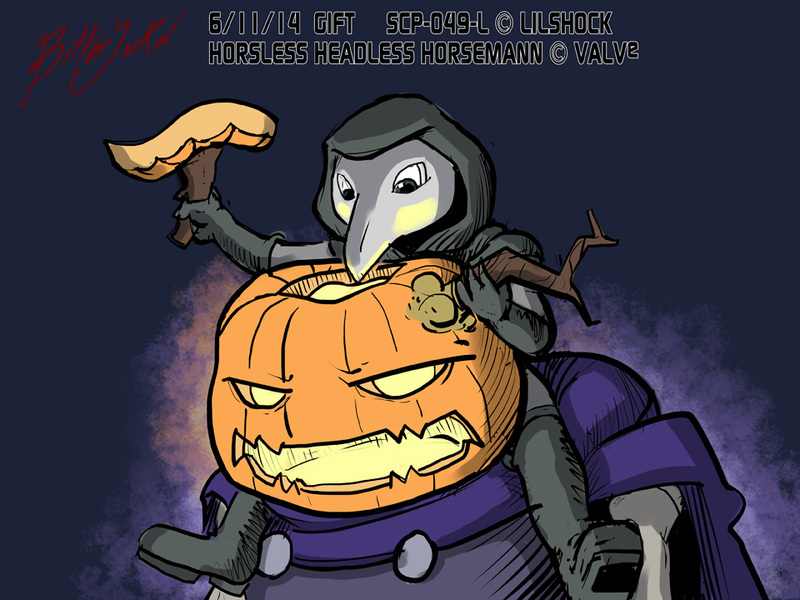 Here's one annoyed Horseless Headless Horsemann. L and Horsemann! I ship it so hard! X3 I love this so much! This picture is just so darn adorable!